Follow the Canadian Team as they prepare for and Compete in the 2017 World Gliding Championships. End of AU adventure - container ready for pickup. Thank you to all pilots for letting us fly some amazing gliders. 1. Practice - easy and fun flying . 3. From contest day 4 to contest day 6 - trying to fit in . We had 6 practice days from December 31 to January 7. The style of flying on those days was almost like on a regular XC day at SOSA, or some of the contest days at Canadian Nationals . We were setting up our own tasks or flying as set by organizers . Start time was flexible and in the biggest gaggle before the start we had not more then 10-12 gliders, and usually 4-5 on course. Even when the results were not too good , I could easily see my mistakes and ways to fix them, blaming most of it on being rusty after sitting on the ground for 4 months. This simple answer made me overconfident . 2. First half of the contest . But when the real contest started my confidence was gone from day 1 . I was shocked by the speed and aggressive style of flying by most of the pilots in my class . Before the start, gaggles were still more or less organized, and when we stopped climbing after reaching thermal top there were just a few pilots who were trying to cut through and get inside , closer to the core to gain extra few feet . It changed when we went on course . Cutting in front of the other glider in the thermal , trying to get a stronger climb , starting to turn in the new thermal just few seconds after leaving previous one, or changing direction and crossing in front of a glider going straight was becoming a normal style for many pilots . It takes time to get used to this way of flying, and in the first few days I was spending too much time trying to adjust my piloting skills, and was lacking in tactical thinking - I just didn't have time for it .My other weakness, which affected my results, was the speed of decision making - I was too slow . If you think that flying in the gaggle is simple - just climb with the fast guy and move along - you are wrong Following this simple formula, you will end up on the bottom and lose the group at the end . A gaggle or group with 15-25 gliders is always evolving; it separates into a few independent groups , converges into one group again , all while moving forward. This pattern repeats very quickly. You are constantly facing choices of following different groups , climbing in different thermals, or moving from one group to another . To make those decisions on time during the flight can put you on the podium, and making them too late might put you on the field . Understanding of the gaggle style of flying, and a way of dealing with all tactical and strategic problems, came to me a little bit too late and didn't leave me any time to work on the details . The weather gave us only three more days. Finally the fun part of flying came back . I started enjoying flying and even prestart gaggles didn't irritated me anymore - I realised this just a part of the game, and you have to have the patience to be part of it .I started to fit in and as a result my confidence come back together with the higher scores . Our crew and team captain Joerg have done an amazing job helping us and supporting us in this event . I'm very grateful for the efforts from everyone within and without the gliding community that made participation in 2017 WGC possible - we couldn't have been there without you. And a big thank you to our Australian hosts for their hospitality toward all of us pilots and crew. I would like to express my gratitude for the overwhelming support of the gliding community in Canada. Your kind words of encouragement and support through out the competition were heartfelt and a big boost to morale. I am very proud to have had the opportunity to represent Canada on the international stage. Although frustrating at times it was a lot of fun to fly with and learn from the best competition pilots in the world. What follows is a bit long for my taste but there is a lot of data to digest. These observations are made by someone with little experience so should be taken with a grain of salt and a big spoon of skepticism. The pre-start gaggles have little to do with climb optimization. Most of the time the lower guys in the gaggle climb faster than the guys at the top. As the lower gliders catch up the gaggle compresses in the vertical axis and spreads out horizontally. Near the top you are flying wide circles, low bank - high speed. In the gaggle most of your concentration is spent on avoiding gliders you can see around you and not upsetting the system too much. Guys who try to out climb the others generally don't succeed and cause others to react rapidly which causes more dangerous situations. In the worst cases some gliders leave the gaggle because it isn't centered, hit the core on their way out and start turning in the opposite direction. I have heard the gaggles described as "A knife fight in a phone booth", I don't think this description is far off. "It is a sad measure of how this competition has been for me, that yesterday I made no real decisions of my own, and finished in third place! I just followed the pack, and for me, that is not a measure of skill. We need to do something about this. The answer is not simple, but many pilots I have spoken to feel very jaded about this problem." Pair flying can be of great benefit provided it works, if it doesn't it will be a distraction and the pilots are better off flying individually. As a member of a pair one has to be able to put away their ego and take pleasure in their partners success. For some of the European teams this is easier to manage as they are funded and the pilots simply take orders from the coach. As in any partnership being able to communicate effectively seems to be key to successful pair flying. Sergei and I did try to team fly but communication was an issue. Flying at this level is quite involved and having to tell your partner what you are doing or observing adds an extra layer of complexity. Even if you succeed your partner may be busy and misses your transmission. Personally I found it very difficult to express myself clearly, concisely and in a timely manner. Quite often I would try to tell Sergei something only to find out he had already moved on and the information was obsolete. On the occasions we were separated Sergei and I still tried to pass on information to each other. It takes many contests to develop and synchronize a pair. In North America this is nearly impossible as we do not allow pair flying. Additionally Team Canada typically only sends one pilot per class as our IGC Country Ranking does not allow for a second pilot, so a pair does not have time to develop. The team is essential to success. Jerzy Szemplinski, Dave Springford, and Joerg Stieber have many years of world level experience which they shared with us; I am grateful for their mentorship both in Benalla and over the past 10 years. The team is not only the pilots and Captain, we were lucky to have a very dedicated and experienced crew with us. Although crewing for other pilots Maria Szemplinska, Virginia Thompson, Jarek Twardowski and Marian Rakusan were always willing to land a hand. 2W crew, Marian Nowak, was instrumental in the smooth operation on the ground both before and after flying. To improve one has to practice. North American contests will make you a better pilot but do not prepare you for flying at this level. Until recently the only chance we had to practice this kind of flying was at the WGC. This is expensive, infrequent, and too late. 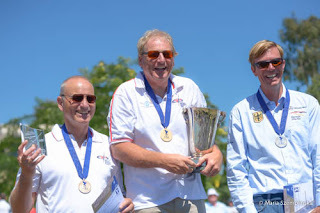 If we want to increase our world ranking the Pan-American championships are a good opportunity and we should do whatever we can to support Canadian pilots flying at these contests. We should also look at developing a more structured coaching program. As always all of this takes time and money, things most of us do not have in abundance. 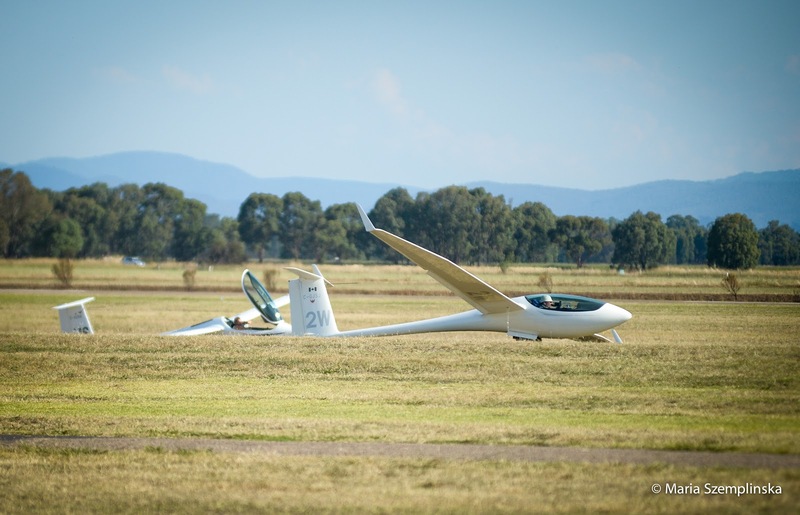 I have been very fortunate to participate at the 34th FAI World Gliding Championships in Benalla, and will work hard to improve my results in the future. In virtual reality anybody could be called a winner no matter what points difference is there, its just a dream, while in reality the winner is who got the most points. German Team in 18m class didn't do team flying and still they placed on second and forth place. Both pilots had their own strategies and it worked for both of them. To be clear : there was never any discussion about the Canadian 18 m "team flying" before Worlds in Australia and to claim that I was obligated to do team flying is misleading. I informed Team Manager that I can share all information in the air like I did in Uvalde or other Worlds, but without "team flying". From my team flying experience for 6 years with multi time world champion I can say that pilots not practicing for years team flying do not have any chance for better results. It is known that each pilots has his own style of flying and successful teams are such, where pilots have compatible style of flying and practice together. Best example of a true team flying is German Open class team where both pilots fly together for years. in effect to worsen result. I admire Dave's excellent results on some days without any of my help or team flying attempts and this only proofs that he is better off without me and team flying. So any complaints that he could perform better with me has no merit and his line of thoughts is confusing at least. He had great results till he made some mistakes which all pilots do and this had influence on his final scores and I have nothing to do with it. As per contest rules there is no such thing as virtual ties. There is no such class as "team class" and there are not " 2 pilots team scores" only individual pilots scores. The results are black and white, a pilot with cumulative highest score after all valid contest days is the winner by 1 point or 1000 points. World titles were lost by small number of points difference and I never saw a Virtual World Champion because of it. Results from Open class shows exactly 13 points difference between World Champion and second pilot or "first loser" as we joke when we finish in second place. Picture shows Open class pilots with different medals each despite just 13 and 29 points difference as below. In 10 points spread we can fit 10 pilots and only one will be the winner.